On the opened on October 10 in the capital "Crocus Expo" exhibition "Agrosalon-2012" Chelyabinsk Tractor Plant has submitted a potential four-cylinder "T" series. On the country’s largest exhibition of agricultural machinery and equipment CTZ demonstrates the novelty with Noginsk Fuel Equipment Plant. Chelyabinsk diesel at the plant equipped with electronic fuel pump regulator to replace a similar unit with a mechanical drive. It is planned that the partners from Noginsk will deliver a modern fuel equipment for the new tractor engines, the serial production of which is due to start at the Chelyabinsk Tractor Plant in the next year. Moscow "Agrosalon" where experts and potential customers will be able to meet with prospective Chelyabinsk "four", will run for four days and will end on Saturday. 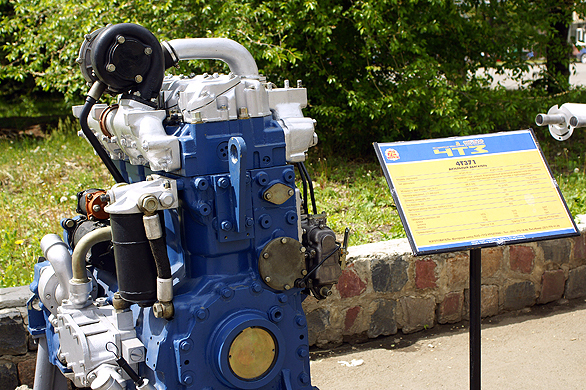 Diesel engine 4T 371 designed for prospective tractors T-1K and T-1P, for use in industry and agriculture. a place of connection and installation of fluid heater. — relative humidity 98% at 25 ° C.